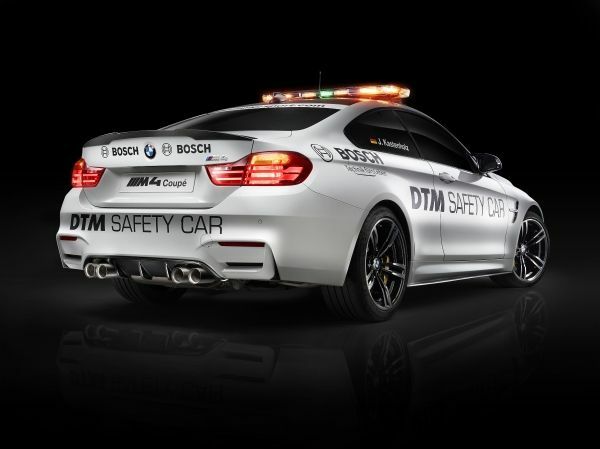 BMW revealed the M4 Coupe DTM safety car. It is aimed to lead the other BMWs at the 2014 DTM season. 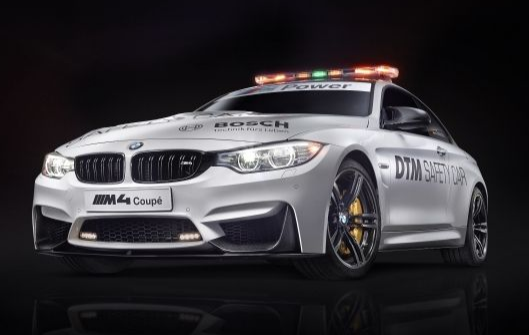 Based on the production model of BMW M4, the new sports coupe debut as a ‘safety car’ will take place at the race at the Nürburgring (DE) on 17th August 2014. Under the hoods remains the same 3.0L, 431-hp six-cylinder inline engine with M TwinPower Turbo technology generating a maximum torque of 550 NM spread over a wide array of speeds. The BMW M4 Coupe accelerates from 0 to 100 km/h in just 4.1 seconds. A team of BMW M department started working on it in winter 2013, and they assembled the basic car at BMW plant in Munich. From there, the BMW M4 Coupe was transferred to the BMW M factory in Garching, where the assembly and modifications continued by hand. On inside, the rear seat is removed and instead a roll cage and Recaro racing seats with Schroth belts for its outings are added. Furthermore, the car is also equipped with LED lights on the front apron, a radio communication system, LED lights on the roof and a special livery. The delight of package M Performance Parts included – the exhaust silencer system, front splitter, black front grille, mirror caps, rocker panel attachment and rear spoiler to the rear diffuser. The modifications took approximately two months to complete.